Meet the woman with over 20 years of Red Cross experience. Anne Kirsti Vartdal (58) has countless of field missions behind her. She has experienced how much harm humans can do to each other, but still has faith in the power of humanity of the Red Cross Movement. Before she went on her first Red Cross mission, she had 10 years of experience as a clinical nurse. Then, one day in 1994, she found a message left on her phone from the Red Cross. They wanted her to travel to Bukavu in Zaire (Democratic Republic of Congo/DRC). Due to the genocide in Rwanda at that time, the DRC received huge numbers of Rwandan refugees. Anne Kirsti was asked to work a Health Delegate, supervising nutrition and vaccination activities in a refugee camp. She did not doubt even for a second whether not to and the second she got on the plane to DRC, she knew that this was exactly what she was supposed to do. After this mission, Anne Kirsti kept her intentions and did a number of following missions. 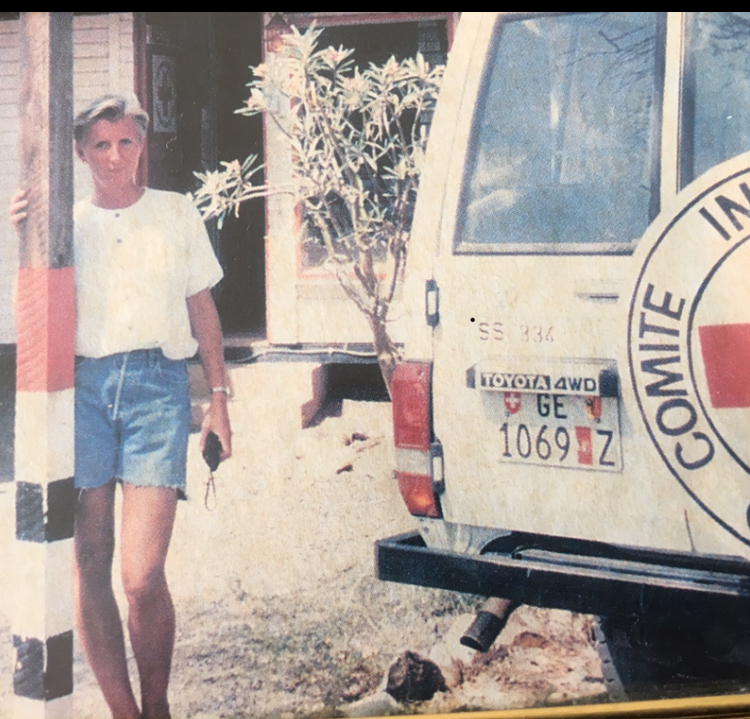 Anne Kirsti next to the ICRC car during one of her first missions in Lokichokio , Northern Kenya in 1995. In 1997 she spent about 8 months in South Sudan working as a Field Health Delegate with ICRC, in Bahr El-Ghazal and Jongley. The task was to support several small clinics: to do training of staff (who often did not have any formal training) and support them with basic medicines. In practical terms this meant camping in the field every week, in different villages, sleeping in a mosquito-dome in the open or maybe in a tukul (mud-hut). The only thing that protected Anne Kirsti and her colleague was a fence around the property they stayed in. Occasionally, a few cows and cobras did come to visit. There was no electricity and no light, so they had to go to bed under their mosquito nets around sunset. They had to bring everything needed for a week, including food, kitchen utensils, mattresses and a chair each. Normally, they could get hold of a chicken somewhere and if they were really lucky they could get antelope meat. When doing assessments, Anne Kirsti and her colleague travelled to villages on bikes, after being dropped by a plane on a rough landing strip. From time to time, the bikes broke down and they had to use resin from trees to fix the holes in the bicycle tires. The means of communication were different in 1997 from today, and to be able to contact other Red Cross personnel in South Sudan, they used what was a cellular phone at that time: a bag phone. This was a phone built into a suitcase. The cables of this phone actually had to be connected to trees in order to obtain signals. Anne Kirsti and her colleague always camped close to the airstrips in case they had to be evacuated, which happened every now and then. This was due to the actual conflict coming to close to the place they were staying. They put their trust in being protected by the Red Cross emblem on the roof of the airplanes, and by knowing that the people living in the villages they were visiting would inform them if there were security concerns. 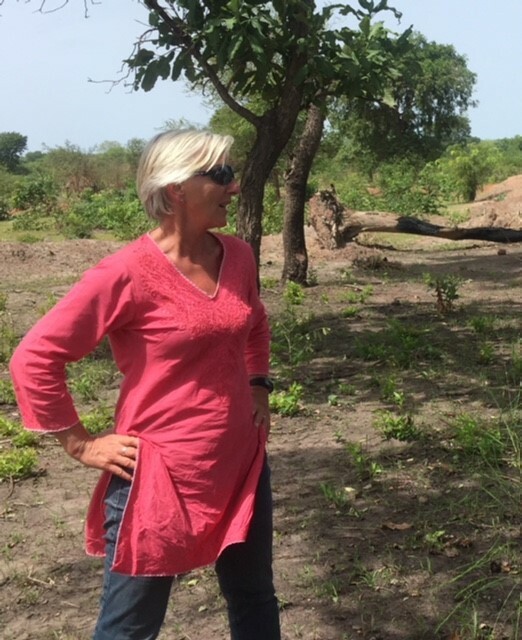 Anne Kirsti during her last trip in to South Sudan, May 2018. After years of missions and experiencing how much harm humans can cause each other, one might think that Anne Kirsti would lose hope in humanity. Still, she has faith in the power of humanity after all these years in the Red Cross Movement. She sees how much of a difference the Movement can do to people’s lives and how the world is gradually developing in the right direction. She looks back at her first time in Kenya for instance and sees how much the country has developed since then. The economic development has been booming and the education systems are very much improved, so an increasing part of the population has access to higher education and the middle class is increasing, which is needed for a country to move out of poverty. 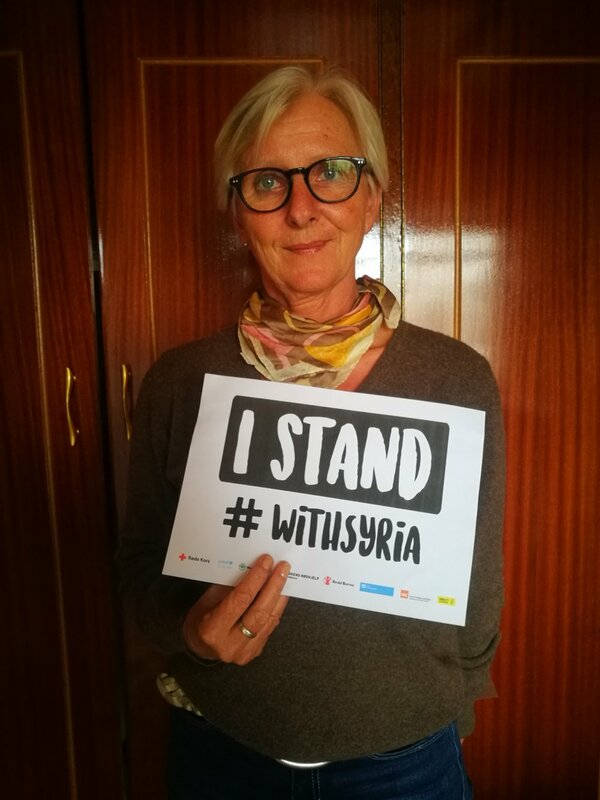 Anne Kirsti marked 7 years since the war began in Syria.. However, there are humanitarian needs that must be met and the work that the Red Cross Movement does is still crucial. Anne Kirsti is critical to the way the media and to some extent also humanitarian organisations, such as the Red Cross actually portray the Global South and particularly the continent of Africa, as poor. This creates an “us and them” attitude towards people in the Global South, which is degrading. The challenge is to establish images that present development and people in need of humanitarian aid in a dignifying and positive way, while also be able to do fundraising. “It should be possible to find a way that portrays the progress, while even collecting more to reach further – building on that”, says Anne Kirsti.